Cite page (MLA): Wisnicki, Adrian S., and Megan Ward. "Scope of the Edition." In Livingstone's Final Manuscripts (1865-1873). Megan Ward and Adrian S. Wisnicki, dirs. Livingstone Online. Adrian S. Wisnicki and Megan Ward, dirs. University of Maryland Libraries, 2018. Web. http://livingstoneonline.org/uuid/node/2301477f-224c-4b1b-88b1-bfdffbec2b6d. This page defines the scope of our critical edition of Livingstone’s final manuscripts (1865-73). The page overviews the importance and content of the manuscripts, then enumerates the items published through our edition as high-resolution images with critically encoded text and full metadata; as high-resolution images with full metadata; or in encoded facsimile. The page closes with a synopsis of the critical materials included in the edition. The present edition encompasses the entire manuscript corpus related to Livingstone's final expedition to Africa (1865-73) held by the David Livingstone Centre in Blantyre, Scotland. This set of documents is possibly the most comprehensive and diverse surviving collection of manuscripts related to any single nineteenth-century British expedition to Africa. day-to-day diary entries and sketches from Livingstone's travels over large portions of eastern, south central, and central Africa. The materials represent multiple stages of manuscript production, from notes and sketches drafted hurriedly in the field to thoroughly developed narratives and detailed maps. The materials also complement the manuscripts from the final journey published by the Livingstone Spectral Imaging Project. In the nineteenth century, Horace Waller edited, radically revised, and published a limited assortment of these manuscripts as the Last Journals (1874). For the last 140 years, this published work has served as the primary source for this period of Livingstone’s life, his travels, and the many aspects of nineteenth-century African history that he recorded. Our edition begins the work of a full-scale re-evaluation of these materials. We present the manuscripts in our edition in one of three forms: 1) as high-resolution images with critically encoded text and full metadata, 2) as high-resolution images with full metadata, and 3) in encoded digital facsimile form. We also include a set of supporting critical materials to illuminate the manuscripts and facilitate further critical exploration. 'Group of Relics, Comprising Articles Formerly the Property of Dr. Livingstone, with Susi and Chuma, His Faithful Followers.' Copyright Wellcome Library, London. Creative Commons Attribution 4.0 International. Such Victorian photographs (and, in this case, their captions) exemplify the complexities inherent in nineteenth-century source materials related to David Livingstone. This photograph recognizes the often hidden contributions of non-Western companions, such as Susi and Chuma, to the project of British exploration. The photograph also presents the manuscripts at center (most of which are published in the present edition) in one of their historical contexts. However, the photograph also also appears to objectify Susi and Chuma by presenting them as curios amidst other curios, including the head of a lion at lower left. The image is one of a series taken of Susi and Chuma with Livingstone's artifacts. For another such image, see our edition home page. Twelve of Livingstone’s final field diaries (1865-73). Livingstone used these diaries to capture his immediate experiences in the field. Livingstone has numbered the diaries as I, II, III, IV, V, VI, VII, X, XIV, XV, XVI, XVII. The remaining five diaries are held by, respectively, the National Library of Scotland (VIII, IX, XI, XIII) and the Livingstone Museum, Zambia (XII) and may be added to Livingstone Online at some future date. 1485 images. The Unyanyembe Journal (1866-72). Livingstone kept this journal at Ujiji and periodically returned to it to copy over his diaries and letters. In March 1872, Livingstone entrusted the journal to Henry M. Stanley at Unyanyembe; Stanley then carried the journal back to Britain. 766 images. Three bonus texts: a fragment of Field Diary XII (1868; manuscript held by the Wellcome Library, London), the second Unyanyembe Journal (1872), and notes and calculations for Field Diary XVII (1873). These texts provide additional insights into the production of the field diaries and the original Unyanyembe Journal and offer a representation, in miniature, of Livingstone's composition process during his final travels, from initial field notes, to intermediate diary, to polished journal. 16 images total. Six Notebooks, among them three numbered notebooks (1871-72), one unnumbered notebook (1866-70), a notebook of "Observations of Kuzinga-Mubozwa Country" (1868), and one notebook of astronomical observations (1869). Livingstone used these notebooks to record a vast array of random observations and other types of information. The notebooks can thus function as either first-stage field records or as second-stage documents positioned between diaries and more polished journals. 484 images total. 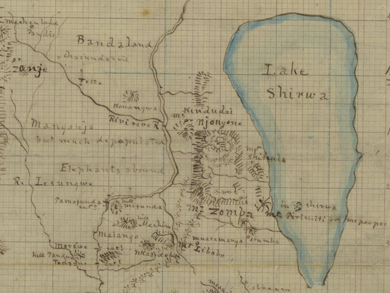 Nine Maps, including a map of central Africa created sometime during Livingstone's last expedition plus a set of undated maps made in the 1870s that cover 1) the eastern end of Lake Bangweolo, 2) the area north of Lake Bangweolo, 3) the area north from Lake Bangweolo to the Luango River, 4) the area north of Lake Bangweolo and Lake Tanganyika, 5) the southern end of Lake Tanganyika, 6) the southern end of Lake Nyasa (two maps), and 7) part of Livingstone's journey in Nanguwena country. These maps contain integrated versions of geographical information collected over longer periods of time, including data gathered first hand and details derived through interviews with Arab and African travelers. 24 images total. Introductory essays to the Unyanyembe Journal and the field diaries as a whole. These essays develop broader discussions of the journal and the diaries by combining analysis of key thematic threads with illustrative passages drawn from the texts themselves. Collectively the essays foreground the breadth of conceptual and cultural material encompassed by Livingstone’s manuscripts and highlight the value of these manuscripts as relatively untapped historical resources. Short introductory essays to the twelve field diaries and three bonus texts included in this edition. These essays orient readers by the key material and textual features of each text, overview principal narrative events, and locate each manuscript within the larger context of Livingstone’s final travels. Additional critical materials, including a page on illustrations related to the aftermath of Livingstone’s death, our TEI P5 encoding guidelines, and a project bibliography. These materials provide comprehensive information on our strategies for coding Livingstone’s manuscripts; illuminate additional historical contexts for the production and preservation of the final manuscripts; and offer further avenues for the study of all the materials included in this edition. Our edition thus brings together a rich selection of critical materials with a vast amount of primary materials: 2,267 critically encoded images of diary and journal pages, 508 additional images of notebooks and maps, and 821 pages of encoded published text. The materials, alongside those already available through Livingstone Online, span a range of genres and open every facet of Livingstone’s final expedition and the many African cultural contexts that he documented to critical scrutiny and evaluation. Additionally, the multiple stages of textual development captured in these manuscripts open a unique window onto the Victorian publishing industry and reveal how this industry shaped records of cross-cultural encounters in far-away places like east and central Africa into the historical narratives that have come down to us today.